Posted June 9, 2017 by Josette Farrell in News. CARNMORE NS displayed silky skills, grit and determination to win at the SPAR FAI Primary School 5s Programme National Finals last week. Carnmore claimed honours in the Girls ‘B’ School Cup after a tough campaign which began in March with county blitzes held nationwide. 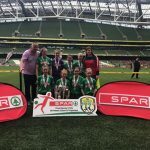 They then progressed through regional and provincial finals to make it all the way to the hallowed turf of the Aviva Stadium. 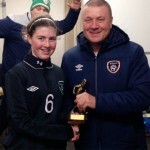 Elisha Bohan from Carnmore impressed the FAI coaching staff on finals day to claim the Girls ‘B’ Schools Cup ‘Player of the Tournament’ award, which was presented by SPAR ambassador and former Irish International soccer player, Keith Andrews, much to the delight of the Carnmore supporters. 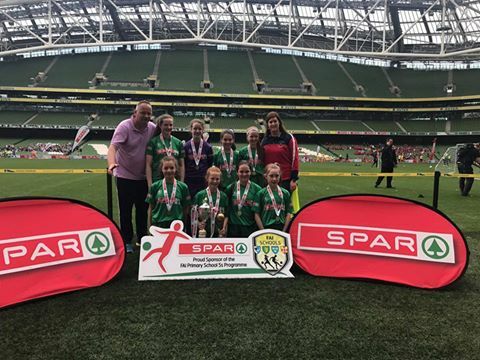 In total, there were four Galway schools involved in the national finals with Scoil Chiaráin Naofa (Doorus) finishing second in the ‘A’ Schools Cup, Scoil Iognáid third in the ‘C’ Schools Cup, and Scoil Róis (Taylor;s Hill) were second in the Girls ‘C’ Schools Cup. 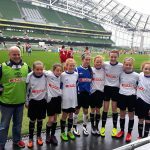 A total of 192 children, representing 24 schools and 12 counties had the opportunity to take to the field in Aviva Stadium, the home of Irish football. Fourth, fifth and sixth class students from Galway, Donegal, Monaghan, Cork, Dublin, Meath, Sligo, Tipperary, Clare, Kilkenny, Limerick and Louth all walked through the tunnel to a carnival atmosphere at the national finals, cheered and supported by thousands of friends and family who made the trip. 28,576 children from 1,495 schools started out in blitzes held nationwide, building on the success of last year and continuing the incredible grassroots growth of the programme. The level of girls participation has been a major success story this year with an impressive 22% jump in numbers from 9,320 in 2016 to 11,384 in 2017.